A wonderfully presented, two bedroom apartment located in the heart of the city centre. Complete with secure underground parking, an easterly facing balcony and elevated, dual aspect views over the city centre. A must view apartment in one of Plymouth’s landmark buildings. SUMMARY A wonderfully presented, two bedroom apartment located in the heart of the city centre. Complete with secure underground parking, an easterly facing balcony and elevated, dual aspect views over the city centre. A must view apartment in one of Plymouth’s landmark buildings. LOCATION Ocean Crescent is a landmark building situated in a convenient, central location with easy access to the city centre. The city centre has a wide range of amenities including the national renown Theatre Royal, Drake Circus shopping complex. The historic Hoe and Barbican areas are within walking distance and include a fine array of restaurants, cafes, bars and bespoke boutiques. The A38 trunk road linking Plymouth to Cornwall and the rest of the south west is only four miles to the east. DESCRIPTION Located on the fifth floor, you enter the property via a solid wood into the hallway. The hallway has access to the main open plan living space, plus both bedrooms and the bathroom. There is a solid wood floor, with under floor heating and a large storage cupboard housing the boiler. The open plan living space is a great place to entertain and has dual aspect views across the city centre. There is a fully fitted kitchen with a range of integral appliances including a washer/dryer and a electric hob with stainless steel extractor hood over. The open plan living space has French doors leading out onto the balcony. Both bedrooms are a of a good double size and have elevated views over the city centre. The master bedroom has a built in double wardrobe, with bedroom two having a built in single cupboard. The bathroom has a panelled bath with shower over head, a low level w/c and a hand wash basin with mixer tap over. The bathroom is tiled from floor to ceiling. OUTISDE Externally, the property has a full enclosed balcony which is east facing. 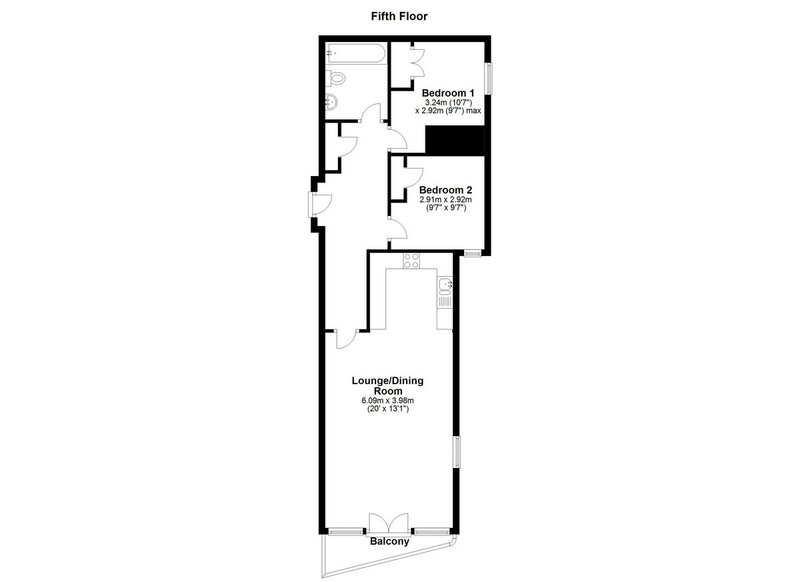 The property has a secure allocated underground parking space.